EILEEN FISHER PP PETITE Waterfall Open Front Cardigan Brown Biege Blouse. Condition is Pre-owned. Eileen Fisher Green Short Sleeve Open Cardigan. Condition is Pre-owned. Shipped with USPS First Class Package. Great condition. One small hole on back shown in pic. Dark green. Made with Italian yarn. 100% Merino Wool. Lovely Eileen Fisher cardigan. Light mint/spring green color. LENGTH-18"FROM BOTTOM OF COLLAR TO HEM. Eileen Fisher. Fabric Content: 100% Linen. Style: Red orange light open knit sweater, with a wide crew neck. Roll up raw hems. Hits slightly below waist, with longer sleeves. Always look at the pictures, because a picture is worth a thousand words. Material : 100% Organic Linen. Sleeve Length: Taken from the shoulder seam to the cuff of the sleeve or, if there are no shoulder seams, from the collar to the end of the sleeve. Chest: Taken from arm pit seam to arm pit seam. Eileen Fisher. Sleeve length 21.5". Torso length 21.5". Condition: item is in good, gently used condition with no spots, holes, or stains. Size: Petite. Condition: This sweater is in very good condition. Color: Green. We will be happy to help you. Waist: 15.5". Chest: 17". Eileen Fisher short sleeve long cardigan PP. Condition is Pre-owned Gorgeous Eileen Fisher open long cardigan with shorter sleeves. Shorter than 3/4 length but longer than traditional short sleeves. Length 28”. Cinched waist at the back and has a tie that can be tied at the back or front. Silk blend. Petite P. A beautiful purple color, perfect for fall! Item: Eileen Fisher Petite Cardigan. Color: Blue. Taken when the item was laid on the ground, flat. Condition: Good. Armpit to Armpit: 16". Size: PP/PTP. Pink, stretchy heavy knit, 100% silk, v neck. Shoulder to bottom hem: 21.5". Perfect Condition. Beautiful sheer knit and seam detail. 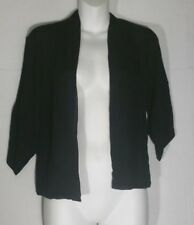 Eileen Fisher Petite Cardigan Solid Black Long Cuff Sleeve Open Front Silk Drape. Length (shoulder to hem): 28". Pit to Pit (Across Chest): 18. Condition: Good used condition with no major sign of wear such as wash wear, fade, stains, pulls and holes. Eileen Fisher. Knit Sweater. 37% Linen, 27% Cotton, 26% Viscose, 10% Nylon. Long Sleeve, Crew neck. Eileen Fisher. Cardigan Sweater. Open cardigan. 80% silk & 20% cotton. Details-open front light sheer knit linen drape cardigan. hard to believe, I know. I will do everything in my power to correct my mistakes. I will respond as soon as possible. Eileen Fisher Cardigan. Color -purple. Eileen Fisher sweater in a soft blue green color. Nubby. open weave crochet. Sweater has rolled hems and triangular stitch detail throughout. Great worn gently condition. Size PP. Enjoy! Xo Measures 15.5" pit to pit, 21.75" sleeve, and 19" length. For the fellow tiny Eileen Fisher ladies out there! Chest: 16" - pit to pit. Length: 15" - top of back neckline to hemline. This is a size pp (petite) textured cardigan sweater with an open front and 3/4 sleeves by Eileen Fisher! NEW EILEEN FISHER PETITE SMALL OPEN WEAVE OF LINEN AND NYLON BLEND LONG SLEEVES CREWNECK. 63% linen and 37% nylon. Can wear all year round. Mint green. Length 21 1/2" front 23 1/2 " back. Chest: 32.5-33.5". Side slits. Length: 28". 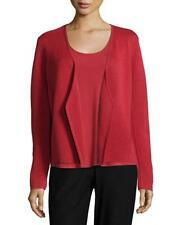 Beautiful Eileen Fisher Pinned Front Crochet Knit Cardigan. I feel there's a role for EILEEN FISHER to play in this shift by sharing the collaboration skills we practice and helping to create the kind of change that wouldn't be possible if each of us acted alone. Eileen Fisher V-Neck Tunic/Sweater Merino Wool "Viola" Size PP "NWT" 100% Merino Wool, purple angled tunic v-neck with slit on side, slight angle to hem line being longer on the slit side. Ribbing on hem, cuffs and neck line. Hand wash or dry clean. PLEASE SEE PICTURES FOR DETAILS. Measurements: under arm to under arm 18", sleeve from shoulder sleeve to cuff 26", sleeve under arm to cuff 18", length varies 32"
It's short sleeved and has a scoop neck. Top is a woman's petite size P P. Top is preowned but in excellent condition with no flaws or issues I can see. By EILEEN FISHER. Cardigan Sweater. SIZE→ Petite PP. Waist→ 35". Shoulder to Cuff→ 16". Shoulder to Shoulder→ 16". Pit to Pit→ 17". Material: linen. 22" in length. Turtleneck Sweater PP. arm length is approx. across the back is approx.